Retail $43.00 SAVE 20% ! 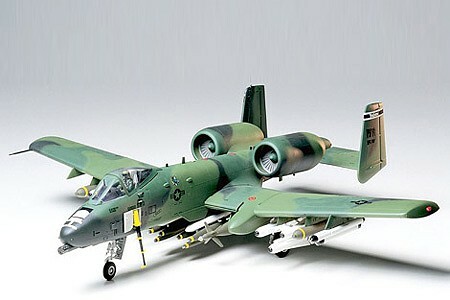 I started a Revell version of the A-10. The fit was so poor, I threw it out and got the Tamiya version. I could not have been happier. Tamiya does a fine job with fit and structural integrity. Exceptional. Appx. 150 parts in olive green and clear with fine recessed panel lines. Weapons including: (6) AGM-65 Maverick, (1) GBU-8, (1). 30mm Gatling gun capable of 2100-4200 rounds per minute, 10 hard- points for 16,000lbs of ordnance, and titanium armoured cockpit. This is an excellent kit from Tamiya. One of the best A-10s on the market. The fit of the pieces is good, the decals are good, and the details are good. The amount of bombs that come with the kit is unbelievable as well. The instructions were easy to follow like all Tamiya kits. this is a great kit for beginners and advanced hobbyists. parts were of the best quality and easy to assemble. "A10 Model Review - Built for an A10 Pilot Friend"
I would give this Model a 5 Star rating. A Quote from the pilot who flew this plane, (Extremely detailed and accurate). This model is very well made and went together very well.